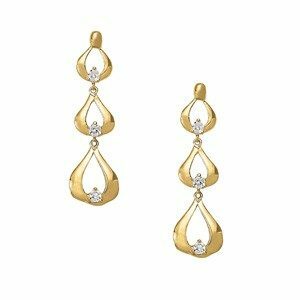 These understated and elegant tear drop earrings have 3 graduated teardrop shapes with diamonds at the bottom of each. Both earring have a total of 1/4 carat of diamonds in them, but larger stones can be used as well. They are an inch tall, but can be made shorter or taller. They are shown with posts, but earwires or leverbacks could be used instead of that is your preference. These are available in Sterling and Continuum Silver, white, yellow, or rose Gold, Platinum and Palladium. Almost any type of gemstone can be used as well. Click HERE to see another style of tear drop earrings.